Ten-speed or even really old bicycle disposal just might find its way onto your to-do list. This is particularly true if you’re planning to find a new set of wheels under the Christmas tree. And, because Old Saint Nick’s visit is right around the corner, you’ll need a plan to avoid being overwhelmed. Trouble is, you’ve got to know if it’s worth the time and effort to salvage an old bicycle. Before we get into how to offload a bike, let’s first take a cursory look at the repair route. As mentioned, because this is an uncomplicated machine, if the frame is in good, usable condition, it can be completely revamped. You just need the parts and some paint to make it look new again. Now, if you’re concerned about cost, this is where disposal becomes a lot more attractive. Bikes generally last about 10 years before it’s time to trade up. Oddly, this isn’t due to the actual, physical condition, but the availability of parts. 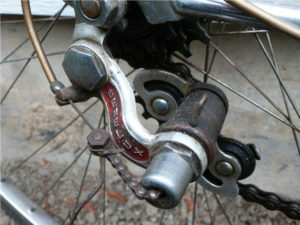 Once a bicycle is 10 years of age or older, parts are super-difficult to obtain. Sell it. If it’s still in good and working condition, you can sell it or sell it to a local shop for parts. A local bike shop might well be able to give it a little TLC and sell it off. Or, sell it directly with a local, online ad. Junk it. Should the bike be in rough condition, take the opportunity to put it together with a bunch of other unwanted stuff. Then, junk it all at once to be free of it all.